We decided to partner with the association Sourires Nomades (from Rennes in the western France): we will be their ambassadors throughout our world tour. We have played the interview game, which you can read here ! - For a few years, Anne-Laure and Pascal wanted to make a long journey. Taking time to soak up the culture of the visited countries and giving this trip a meaning were their two priorities. Animal360 was born ! In October, this will be the big start of a world tour of about 2 years. Seduced by the responsible approach and the solidarity of Sourires Nomades, they will also be our ambassadors during their journey. You will regularly have smiling news from them. Now, let’s focus on this project. Can you give us a brief description of this trip? 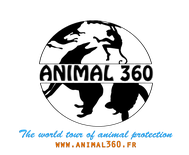 The Animal360 project consists of photo and video reports in animal protection associations around the world. Then, we’ll provide these associations free of charge pictures and videos made for their own communication, and we’ll publish them on our website (www.animal360.fr). Our goal is to highlight the work of (small) associations that are important to us, to portray people who dedicate their lives to the animal cause, and to raise public awareness of animal welfare and more generally to the protection of nature. We know that communication is a crucial issue for the life of small associations. If our videos and photos can contribute by making people want to give donations to these associations, or by making others want to commit, then we will have made a success of our bet. Why did you choose the animal cause? We care about the link between nature and the human kind, on a daily basis. Both of us are impassioned and fascinated by animals in general and are aware of being the live witnesses of the 6th animal extinction ... Today the situation is dramatic, researchers estimate that more than 40% of known animal species have disappeared in the past 30 years because of human activities. It is the fastest extinction since the disappearance of the dinosaurs. It affects us a lot, and we want to "do our part" in our way by making a positive contribution to the species that suffer... because of ours. We are therefore very sensitive to the animal condition in general (even if it is not the only cause that touches us !). Anne-Laure has been a volunteer in animal shelters, we have been a host family for dogs, and we have a few rescues to our credit. Moreover, we are well aware that traveling pollutes. That's why we try to minimize our environmental impact on our trip by offsetting our carbon emissions with the funding of tree plantations. Do you have a specific itinerary? How did you prepare it, on what criteria? We do not really have a specific itinerary, we like to leave room for unplanned events while traveling. We have drawn up a list of countries that we both wanted to discover, with a vague idea of itinerary in mind, but without being set in stone ! We have planned to travel for about 2 years, in about fifteen countries, roughly in Southeast Asia, Oceania, Polynesia, and South and Central America. We have already listed associations that we would like to see and they serve as landmarks. The departure is for early October, the exact date is not yet defined but the destination is : Sri Lanka. On your site, you have already published video reports about associations, you can talk about one of them? We were overwhelmed by our discovery of a Thai association. During a trip last March, we had the chance to discover the BLES association (Boon's Lott Elephant Sanctuary) in northern Thailand. It is a shelter that collects domestic elephants that have been mistreated in the tourism industry. It is an unusual young woman by the name of Katherine Connor who created this center, and meeting her and these elephants was an incredible experience... Her story is beautiful! We will always remember the look of these majestic animals that have regained the dignity and happiness of being elephants, and not machines made to entertain humans. Encounters will have a special resonance on your journey. How will we hear from you? During our journey, we will undoubtedly make very beautiful encounters : in the end, it is largely for this reason that we travel, sharing moments with people who have a culture very different from ours. We will regularly send you “nomadic smiles » taken from the beautiful encounters which will illuminate our journey and our reports.